It is good to see Administrator Huerta move along, though it would have been much nicer to see the President fire him a year ago. For airlines and lobbyists, Elwell has all the right plumage; his record suggests he is a revolving door swamp monster, and an industry loyalist. Not likely to be focused on making FAA accountable to the thousands whose homes and health are being destroyed by NextGen. Click here to view source article at ATWonline.com, or here to view an archived copy, with some analysis footnoted by aiREFORM. When this article was originally Posted by aiREFORM, on 5/17 (22-days after the near-collision), FAA was still not sharing information. New information has since been released anonymously. It identifies the conflicting flight as USAir Flight #432, westbound at 33,000 feet. Details are updated below. On Friday April 25, at approximately 4:16PM Pacific time, the pilot of an eastbound United B757 abruptly descended to avoid a westbound USAirways B757, northeast of Kona, Hawaii. The United flight (UAL1205) was heading from Kona to LAX; it had leveled at 33,000 feet and was established on the oceanic route R578, roughly 200 miles northeast of Kona. Two U.S. Airways flights were enroute westbound, thus nose-to-nose with the United flight. One was USAir663, from Phoenix to Kona, at 34,000 feet; the other was USAir432, from Phoenix to Maui, at 33,000 feet. All flights were tracking along the same oceanic route R578. It turns out Mr. Townsend is a writer, based in San Francisco, who happened to be returning that Friday from a Hawaiian vacation. He is also a bit persistent and adept at online research and contacting FAA and airline officials, and from this he wrote an article. His article is an interesting read, but also a bit disturbing because he documents that, when he contacted FAA officials, they generally blew him off. It was weeks later before FAA initiated an investigation — and that delay may have allowed ATC audio tapes and other hard evidence to be destroyed. So much for accountability. please see page two of this aiREFORM Post. Last November, one of the largest cargo aircraft in the world impacted the ground on the flat plains of Kansas. ATC had cleared the flight to land at the McConnell Air Force Base, roughly eight miles further south from where it landed. Thankfully, the impact was somewhat controlled and happened onto a different runway at a different airport. Nobody got hurt. A copy of the ATC recording (with a transcript) has been posted on YouTube. It is 8-minutes long. It appears to be time-compressed (i.e., long stretches of time between transmissions are removed). This flight was a Dreamlifter, flying as Giant 4241, which had departed Kennedy Airport on an FAA IFR flight plan. According to a news article, the weather was fine during the 9:40pm landing. The last FAA controllers to work the flight were the radar controllers at the Wichita Approach Control. They pointed the flight toward McConnell Air Force Base, descended it, set it up for a GPS Runway 19L Approach, then issued the charted approach to the pilots. After the FAA controllers ensured that the military tower was accepting the approach, they radioed to the pilots and told them to contact the control tower. The flight crew made the radio call and, interestingly, the speaking pilot started to mis-state that they were on a Visual Approach. As it turned out, they evidently were on a Visual Approach, and were NOT flying the cleared GPS Runway 19L Approach. The evidence suggests that they were landing by simply reading the terrain so easily seen in the generally good flight conditions, but they nonetheless told ATC what ATC wanted to hear. It was minutes later that they realized they had a problem … they had made their undeclared Visual Approach to the WRONG AIRPORT! It is interesting to listen to the four people involved in this eight-minute recording — the two pilots, as well as the tower controller and his supervisor. It really sounds like they were all hoping the pilots could just quickly turn around, take off, and land at McConnell AFB, maybe even before anyone noticed what had happened. You can feel their suspending reason for a few minutes … ignoring the fact that this is an enormous aircraft, and it is lunacy to try to consider just flying it out. The Upton Sinclair quote comes to mind. Their ‘dreams’ were quickly dashed at 5:48 on the YouTube video, when the danger of their situation was brought home: a twin engine turboprop suddenly overflew the behemoth. It was sure a good thing that this huge aircraft was hard to miss, parked at the south end of Jabara’s Runway 18. So, just to be clear, pilots do not make up approaches and tell ATC any old thing. In this case, the Dreamlifter pilot quickly corrected himself when he first talked to the tower controller, because that tower controller had been notified by the FAA Approach controller that the flight was inbound on a GPS Runway 19L Approach. FAA’s Approach Controllers issued a GPS Runway 19L Approach to this flight. The red mark shows the approximate position of Jabara Airport, north of the Final Approach Fix (FAF) ‘WARUN’. The underlined ‘3000’ at ‘WARUN’ notes the flight must cross ‘WARUN’ at or above 3000 feet MSL (roughly 1,600 feet above the ground). When they issued that approach, the FAA controllers took on the responsibility to monitor the flight and ensure the approach was executed. The approach controller had to go through years of training and had to show his trainers that he memorized the critical details, including knowing the safe and legal altitudes for each of the available approaches. That rigorous ATC training conditioned the Approach controller to be extremely vigilant about minimum safe altitudes for flight. Somehow, that vigilance disappeared. In this case, the flight was supposed to be established on the route segment between the Initial Fix ‘WITBA’ and the Final Approach Fix ‘WARUN’, tracking a magnetic course of 186° and maintaining an altitude at or above 3,000 feet MSL (see the as yellow markings on the AGPS RY 19L Approach details above). 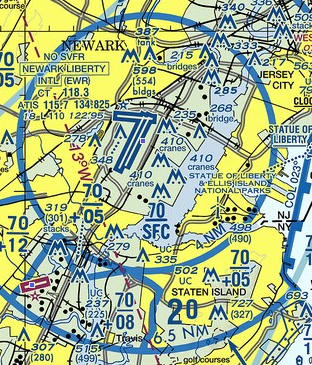 Note the carat symbol just equipment at the west of ‘WARUN’ on the approach map view; this is a radio antenna and the VFR Sectional chart shows it to be 421′ above the ground level, just northwest of the controlled airport marked ‘BEECH’. 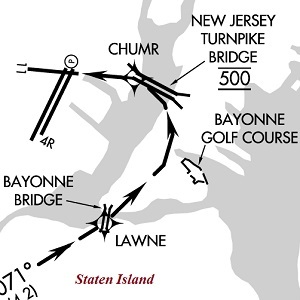 The pilots missed their runway by roughly eight miles. They put the Dreamlifter down onto the ground miles BEFORE a charted antenna obstruction. So, how can it be that the FAA Approach Control, where the approach clearance was issued, produced no alarms when the 3,000 foot floor was busted (by 1,600 feet!) and when the flight’s projected profile would show a likely collision with the charted antenna? Did the radar automation not create an alarm? Did the controller see it but assume (improperly) that the tower ‘had it under control’? Did the military tower have any equipment or procedures that would have (and should have) detected a busted altitude on such a huge aircraft? No calls were made in advance of the incident, perhaps because nobody was looking. So, when the post-incident calls were made, the first reaction of the Wichita Approach controller would have been to file an ATSAP report. He or she would make sure they did so, being careful to present the events to conceal any failures, so that they can receive the full ATSAP immunity, and not be held accountable for their negligence. That excessive immunity is the carrot FAA used to bring NATCA on board, to support ATSAP … which FAA wanted as a way to hide safety reports from citizen FOIA review. What will FAA do? Will NTSB conduct a thorough investigation, or are they being tamped down these days, told to stay out of FAA’s business? Can we expect the ATC aspect of this dangerous error to be covered up, or will the facts be fully presented for Public review? 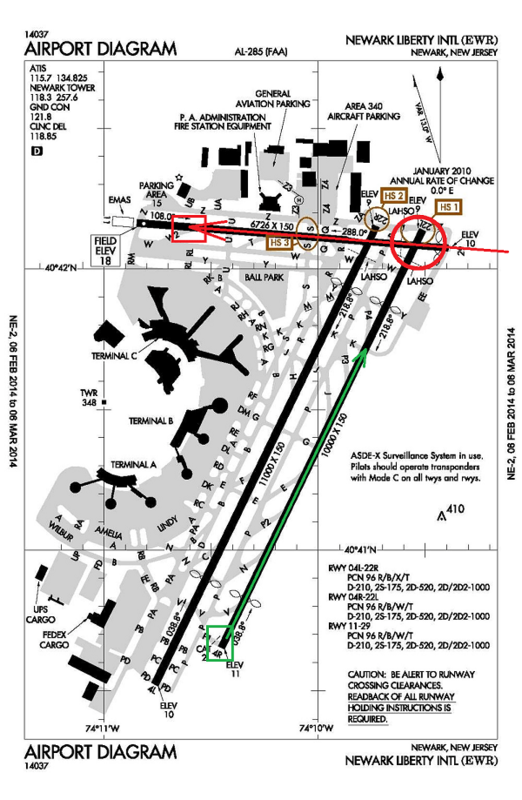 Will FAA share de-identified ATSAP reports so the Public can understand how this incident happened?